Glee Club of 1895-1896. This Glee Club was directed by a student whose name is variously spelled F.G. Rathbun or F.G. Rathburn; the president was McLane Tilton, Jr., who was a member of O.F.C., the Thirteen Club, and the Z Society, and manager of the baseball team. 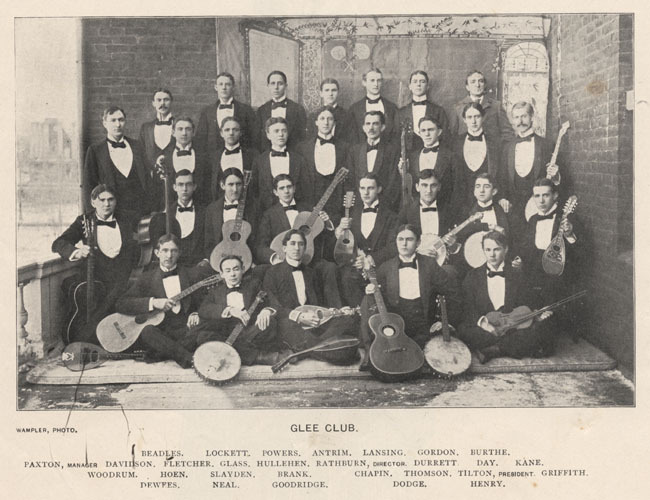 Glee Club of 1897-1898. This group was conducted by George Latham Fletcher and had John Lawrence Vick Bonney as its president. 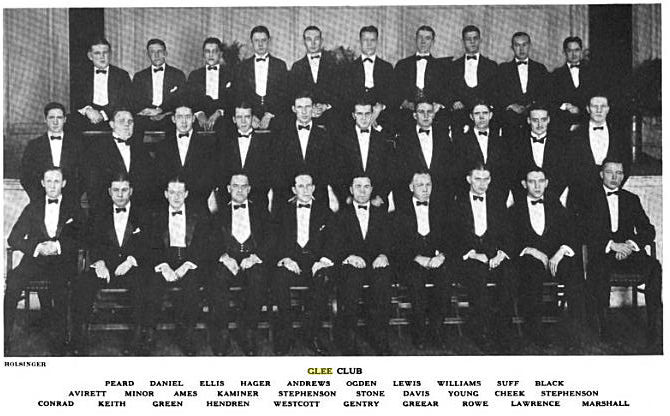 Both were in Eli Banana and the Z Society; Bonney was also captain of the baseball team and voted “most popular man in college.” Note Francis Harris Abbot in the back row; the man who would later be French professor “Monsieur Abbo'” would also conduct the Glee Club in the following season. 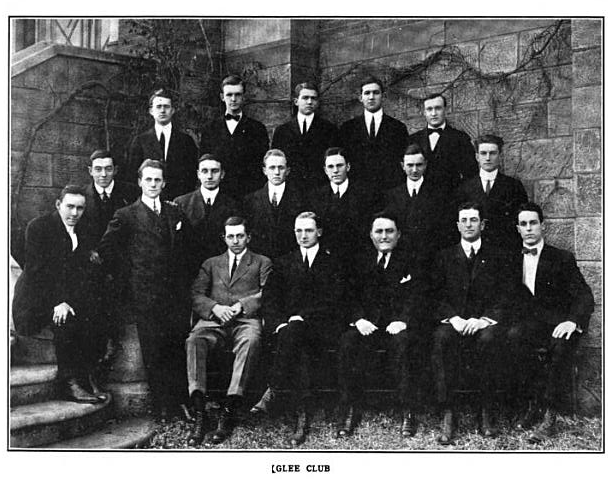 Glee Club of 1911-1912. This season was previously thought to have ended in failure (the group actually disbanded in the fall of the following year), so it is interesting to see a picture of the group looking hale, if not entirely cheerful. Arthur Fairfax Triplett was president that year, and the still-mysterious M.S. Remsburg was conductor. Three of the four officers who disbanded the Club in the fall of 1912 were in the group in the 1911-1912 season. 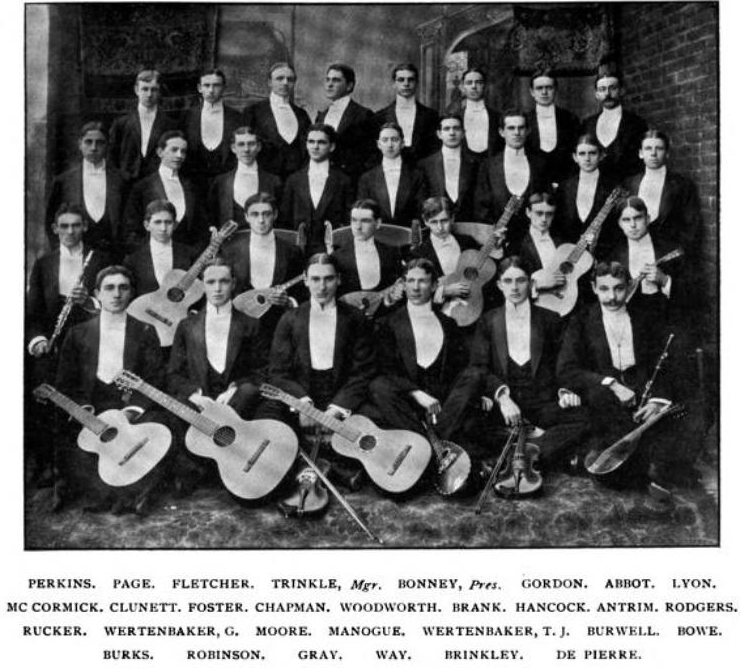 Glee Club of 1920-1921. This yearbook entry cleared up a misapprehension perpetuated by the 1921 Yellow Journal: while John Koch (Skull and Keys, Eli Banana, College Topics) was the president of the Glee Club this year, he was not its conductor. That was Nevil Henshaw, class of 1902, novelist, short story writer, and author of The Visiting Girl, written in 1907 for UVa theatrical group The Arcadians and performed by the Glee Club to no few brickbats in 1920-1921. This yearbook also provides the first documentary evidence proving what was once conjecture: that John Albert Morrow, author of “Virginia, Hail, All Hail,” had been a member of the Glee Club (though he was not during the 1920-1921 season). 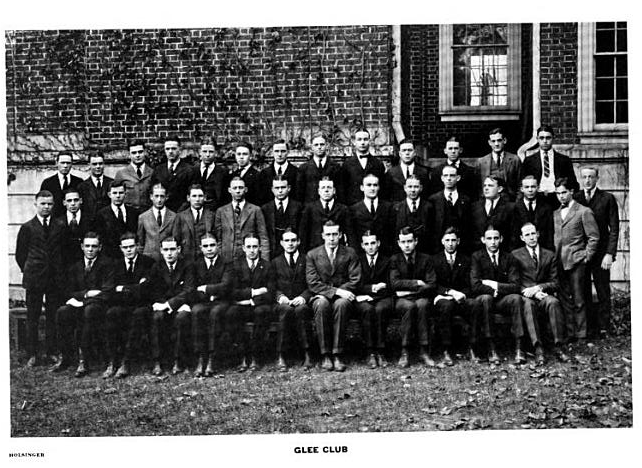 Glee Club of 1921-1922. Interestingly, no conductor is listed for the group this year (Arthur Fickenscher became conductor the following season), but the president, Frederick R. Westcott, was a graduating student that year who served in the German Club. Finally, looking at the accomplishments of our forebears, it’s tempting to judge later generations of Glee Club officers as, to use the modern vernacular, a bunch of nons. It’s hard to imagine anyone covering all the bases of Greek, secret society, yearbook, newspaper, drama club, athletics, and Glee Club today, at least while still graduating.